We have in-depth post-primary election stories on Oliver Koppell's convincing victory over challenger Tony Cassino in the 11th Council District as well as challenger Fernando Cabrera's narrow win over incumbent Maria Baez in the 14th. Also, 14th District third-place finisher Yudelka Tapia says despite her problems with Cabrera's past political affiliations (he used to be a Republican) and residency issues (he only moved to the district a little more than a year ago), she will work with him for the good of the community. The heart of Cabrera's campaign was the relentless support of his congregation at New Life Outreach International Church, a churh he started in the NW Bronx 20 years ago. 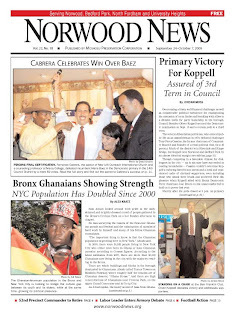 The Bronx (and New York City) Ghanaian population is rising and coming together to promote their culture as well as build a political voice. The new leader of nation's largest labor group came to the Bronx to meet with representatives from the Kingsbridge Armory Redevelopment Alliance (KARA). KARA, alongw with Borough President Ruben Diaz, Jr. and members of Community Board 7, is trying to negotiate an unprecedented (in NYC anyway) labor and benefits agreement with the Related Companies, which is planning to turn the Armory into a shopping mall. Pedro Espada is meeting with local business leaders and community groups as he decides where to distribute nearly $2 million in discretionary funding. And always look to Neighborhood Notes page for local events, programs, services and announcements and to our Out & About page to find out about all the arts and entertainment opportunities in the borough. Want to give us feedback on a story? Have a news tip or a topic you think we should write about? Feel free to send us ane-mail at norwoodnews@norwoodnews.org. Where did Pedro get the $2 million? Clean or dirty money? The money Espada's giving out is clean. Each state lawmaker is given a certain amount of money (taxpayer $, that comes out of the budget) each year to give out to local nonprofit groups for programs and initiatives. Each grant that is giving out is called a member item. For the most part, these member items are used for good things like after-school prgrams and little leagues. In the past, however, the money has also been abused. Espada's predecessor, Efrain Gonzalez, was convicted of using the money to pay for personal expenses, like a house in the DR, Yankee tickets and labels for his cigar company. Hopefully, that answers your question. You have to be kidding! Yudelka will work with Cabrera - riiiiiiighhhhhhht! I wouldn't trust her for anything, this woman is capable of anything. Her campaign funds .... loans ..... was a personal issue? The truth will come out. She should be taken to court. Yudelka is such a liar, she did not call Cabrera. There she goes with her lies...... again! Yes, the latest issue covers (almost) in depth the 11th and 14th councilmanic districts. Just goes to show you that reporters do not always report the truth. The charges referring to member items and theft of honest services were dismissed from Espada's predessor's case. Espada is looking for an outlet where he can use the money in the future. This man is no saint. Here we go again. Cabrera people are showing who they are. The won (sorry stole) but they still have to keep bashing people. And as for these reporters you are right they only write half truths. what do you mean the cabrera people are showing who they are.....what the fact that Yudelka is a liar and is continuing to lie...those are the facts! And how do you accuse that the "votes were stolen" isn't that lying....look in the mirror before you point the finger....there are four more pointing towards your direction. You call Yudelka a LIAR. How do you know if she called him or not are you with him 24 hrs. a day. I would be more concern about your boss and the people he associates himself with. Read the Village Voice. Oh so now, it's time to work together. Yeah right.....give me a break. So now you are asking for the camp to stop bashing and bring division. Ummmm, let me read back to the all the previous blogs.....! James D I guess you can see they just wont move forward. The just want to keep bashing. And they say that they are concerned about the community I guess not. What they should be concerned about is who their boss associates with they should be reading the Village Voice and get educated. now if we can be educated with the fact that after 25 years and 2 Bronx political wars, we need forceful representation in The 14th Council district! NWB Democrats endorse Yudelka Tapia................but we support and hope the independance of Fernando Cabrera will shine through to start the foundation of a better (southern) Northern side than we have had for the betterment of the last 25 years.